Last week, I prayed over something dear to my heart. Running close to empty I needed encouragement. Was preaching a path God really wanted me on? People like the SAP were saying, “Yes, don’t you dare stop.” But the month prior it had felt hard and lonely. In the month prior, I’d tried to find a spot to do live expository sermons (one that’s on a specific Bible passage). Without it I couldn’t be assessed for a unit in my Grad Dip Divinity. Attending church within a denomination that can get itchy over women preaching -whilst studying at a denominational college that doesn’t – has its challenges. So, emboldened by an idea God whispered, I suggested sermon salons. A place where I could practise my sermons on willing guinea pigs. And it grew. The first one outgrew the original idea of my lounge room venue. Which meant I needed a larger space. So, armed with a registration list of Christians and non – and an audience of both genders – I asked my church for a room. A room I received. I did feel I had to explain why the men wanting to attend weren’t unwillingly under my preaching authority. I also had to quiet the sense of unfairness I felt when, setting up the room with tables and chairs, plugging in the data projector, managing my own AV, I thought of my brothers in Christ also being assessed. Who likely have walked into ‘church proper’ on a Sunday, to a pre-prepared room, with a pre-prepared AV desk, with a pre-supplied audience. ‘Just’ walk in and preach. God is kind and gracious, packing my virtual sermon salons with 70+ interested people and 15 to my first ‘live’. But still the sense of unfairness dogged me. Sometimes using my female voice for the Jesus-fella can feel a struggle, as I’ve blogged before. Sometimes I wonder why it’s 2019 and my gender is getting in the way of me being assessed for a course of study. So, at the start of last week, feeling tender, tired and lonely, I asked if He wanted me to give up. I sought out a wise woman who, also in a denomination that can get itchy over women preaching, has been supported by many male senior ministers over 20 years of her preaching ministry. Before I went to meet her, God – in His gracious way during my prayer yurt/ journal/ Bible time – had pressed 2 Cor 3:12 upon me: You have hope in Jesus. So be bold. Except I wasn’t feeling bold. I was needing more. More than what my prayer yurt quiet time was revealing. More than the encouraging SMS from the SAP – Don’t you dare give up! – who had heard the dark creeping in. So, as my my wise friend and I prayed in the glaring surrounds of a coffee shop, I asked for neon. Like He used to use with me back at the start. Forgive me, Lord, but solo Bible time in a prayer yurt is only reminding me of how solo this is feeling. You made it fairly clear a few years ago you wanted me on this preaching path. But perhaps not anymore? If you do want me to keep pressing on, I’m sorry, but I’m really going to need neon to do so. It’s not like he ever picks worthy people! Abraham had little to commend him – but in God’s initiating grace He chose Abraham to start the nation through whom He would bless all the nations. In fact, that’s likely what freaks me out the most. I am the least likely, most obtuse, complaining soul. I ran from Him, for goodness sake, for years. I didn’t want His love, His grace, His offer of hope and forgiveness. When I finally stopped fleeing, I stood there with my hands behind my back, like a small child unwilling to touch the amazing gift because… what if? What if He’d got it wrong? And, oh, even worse, what if I let Him down? “He doesn’t and you can’t,” is a whisper I have heard time and time again from Jesus. From a patient, kind SAP. I have grown and I have learnt that my God makes no mistakes. Even when – especially when – I disagree with the choices He makes in regards asking me to do stuff! As the song goes, there’s no wall God won’t kick down, no lie He won’t tear down, coming after me. And so God began to light my path like a blazing runway at night. The day after my wise friend and I prayed, I received an out the blue to an ‘invite-only’ preachers development workshop – run by someone who amazes me with his storytelling preaching talent and will, I know – with that HS scary certainty – challenge and push me to more. The same preacher whose name my wise friend had shared the day before over coffee – and, no, she hadn’t approached him either. The day after that, another out the blue invite to the same preaching workshop from an attendee. 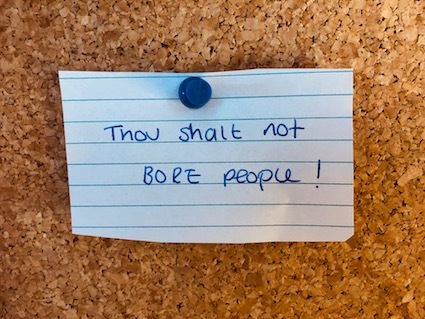 Someone who had prayed and prayed and prayed over me five years ago when she learnt I – supremely unqualified – was applying for a job that had Christianity as one of its essential criteria and could I blag a reference off her? Not being head over heels with the Jesus fella wasn’t going to stop me, was it? Today she is like my favourite bra: lots of support, colourful and close to my heart. The evening after that, asked to jump up and speak, to share my voice, wisdom and opinion at a large, mixed Christian gathering. Yes, God reminded me, I do want your voice out there. And then, in case I needed more, right at the end of the week, beautifully timed on International Women’s Day (IWD), God delivered me a neon blast from my BC past. Not on any day, but on a day designed to recognise and promote unity, celebration, reflection, advocacy and action for women. “I know you!’ she called out as I walked through Circular Quay towards a Christian IWD event. She did? I knew her face too, but couldn’t place why. Turns out she was the guest speaker. A vital, engaging preacher from a Sydney north shore church. But we worked out we knew each other from 20 years ago. Neither of us Christians, then. Back then, we were non-believing, pommie, opinionated, quick-thinking PR pros with our own agencies. Both of us thinking – back then – that GJ&HS needed PR agents, but, ha,ha,ha, we weren’t ever going to be part of THAT campaign. No siree. Ah. No God-incidences. Look. Look what I’ve done with someone so like you. God closed the week with three other gifts. Less neon, as I’d already expressed my snot-monstering, hiccupping awe at what He had provided. Just quiet underlines to keep me steady. An email asking me to preach at a local church. And two people from my church asking to come along to the next sermon salon. But I also need quiet time in a payer yurt to appreciate and reflect upon just how amazing all God’s neon is. If my past five years being a Christian had ALL been cage fighting wrestles, as per my last blog post, I’m sure the smart-alec pastor (SAP) would have expired. Or accepted a mission role somewhere remote without cellular or internet. I think I might have burnt out too. But sometimes, sometimes I miss it. The neon. The unmissable insights that God is taking action in my life. Don’t get me wrong, I love the quiet prayer yurt times. But the WHOO HOO moments are fantastic. Last post, I explained how I’d not written because I worried how boring my faith travels might sound. Sedate, safe, Bible-reading, Bible-college attending, preaching Phil. Compared to the ‘skidding, whoo, WHAT is going on?’ from three-to-five years ago. I’d made me the arbiter of interesting. Not God. How foolish. Really? Who kidnapped me, made me editor of the universe and puffed me up with such writing importance??! Unless I’m called to. Dear God. Anyone would think I’d been marinating a bit too long in theological college and mission. Ah… possibly. I thought the only way to keep writing about GJ&HS was to either get all Bible study exegetical each blog (yikes) or draw out what they were up to with me. But, truly, all eye-rolling nonsense about waiting to be called to write aside – I didn’t want it to be about me! “Write about your new story being part of the old, old story,” advised the SAP. Which – three days ago – made zero sense. As they so often do, they used an early morning wake-up call today and a pressing to listen. This time to an Exodus sermon. Finally, what they were trying to tell me clicked. (Sidebar: If you don’t understand how Israel wandering around in the wilderness for 40 years in the Old Testament makes sense of God’s massive, crazy promise in Jesus in the New, it’s well worth the 29 mins. Link at the end). The main point of the sermon: look at how faithful God was – and is. He made these massive promises to His people that, frankly, looked impossible. How was God going to create a massive nation using the dry and likely limp fertility of two old age Israelites? But He did. Through famine, slavery and desert dust He went from one man with no land to a nation overloaded with loot – blessing after faithful blessing poured out, promise after promise kept. How much more then His promise to us in Jesus? That one day every knee will bow, every tongue confess, that there will be no more tears or pain, and the world that so cuts and grieves us one day will be but a mirage in the review mirror as we step into His eternal banquet. As we step into God’s house, His home, His peace. But while we wait, what do we do? asked the preacher. Do we give up on the promises entirely? Make them small and attainable? Make them more suitable to our small, not God-sized lives? Refuse to accept the super-size me God serving on offer and simply settle? Oh. That struck. Like me: settle for a quiet life that stops writing, Phil, because, gosh, you think you might sound a little like Ned Flanders going on and on and on and on about what GJ&HS are doing in your life. No, the sermon reminded me, as God ricocheted through my headphones and shook my heart. No. The promises of God are not to keep me comfortable. So what if me writing about God makes me fret and worry about looking self-centred (here she goes, writing about her GJ&HS encounters again)? The sermon suggested: first to look for the places where we see God at work. The small signs that He is still rolling out His love and blessings. Yes, Phil, God whispered, for you to see the small and large ways I have changed your life today and over the past five years as part of My larger gathering of you to Me. All those God shoves, all those answered prayers, those crazy Godincidences I used to blog about so often, that blew me away and took me out with awe-full tears at the heart and the knees? They were never simply exciting new God news. They were blogs that strived to unpack GJ&HS. To examine more closely, like a bower-bird returning to the blue shiny glistening gem in the dirt of life, how they were building and sustaining my faith. And then what this preacher said? The most important thing to do, to learn from Exodus is to keep telling the story of God’s faithfulness. “You’ve gotta tell the story,” he said. A cracking one liner, delivered with Canadian-accented colour. THAT line? Right there, today at 3am, wet my eyes with God’s love. “You’ve gotta tell the story,” said this preacher. “Write about your new story being part of the old, old story,” said the SAP. Who gave me this talent with words? Who created my tongue? Phil, you’ve just gotta tell the story. I don’t have to make the story. Heck, I don’t even have to be the story. I just gotta tell it. Over and over, sharing the bower-bird shiny blue gems. Because it gives me hope. So, much as it feels a little presumptuous and scary, I figure, dear reader, it gives you hope too. Of what He is doing in your life and mine, your family’s life and mine, in the lives of the people around us. So I’ll keep telling the story of those God shoves, of the quiet Yurt times and the crazy who-hoo times. I will blog of His faithfulness. Phil, you’ve gotta tell the story. Thank God I’ve got one hell of a subject. If I told you I had met a bloke who could raise the dead with his words, perform heart surgery simply by the touch of his cloak and turn tap water into Grange, you’d be impressed, wouldn’t you? If I said this guy spoke love to asylum seekers, saved the environment with a breath, empowered women on every day, not just on March 8th, tackled the corruption of and abuse by religious leaders, and could fix the public health system by healing all the sick – you’d vote him in at the next election, wouldn’t you? It’d be big crosses on the ballot paper for the Jesus party. You would think I’d be drunk on dizzying amounts of watered up, Jesus-delivered Grange. I had the mother of all awakenings yesterday when I realised I’d domesticated God. I read back through some of the early posts on this blog and wondered, where has the ‘zing’ gone? The SAP received a fair few flippin’ the bird emojis in the early days. I miss those God wrestles. I find my answers in His word, but, gosh, I loved it when I’d launch myself at Him and then see Him reach so clearly into my world, catch me and guide me. Graciously and kindly, He would deliver His Post It Notes of love. It was real, vital and tactile. Plus my immature Christian faith, my pinging around like a meercat on speed, gave me such blog fodder. So entertaining! Originally I wrote to figure out what was lost in translation between the stereotypes by which I’d been misled, compared to the hope-filled, loving reality of having a relationship with GJ&HS. In God’s crazy way, readership grew. He used my own figuring it out via this blog as a way to help others who were figuring it out too. As the months passed, more would press on my heart and out the keyboard: domestic assault. Lack of women’s voices. I began to write less about where I was in my faith and more of what I saw around me in institutionalised Christianity that I perceived as barriers to people meeting the Jesus-fella. Plus, if I’m honest, deep down, I quietly wondered how interesting I could keep making the settled, sedate, safety I was experiencing with the three of them. How entertaining was writing about church each Sunday? My bible college classes on a Tuesday night? The swathes of the Bible I have now read? How systematic theology fascinates me, understanding the historicity of God’s story hooking together, and how His reaching through time and place to redeem people to Him – broken, stuffed-up people like myself – is echoed over and over and over. I mean, I love it. But everyone else? Aren’t cage fights and vodka-Cruiser style Psalmesque slanging more interesting? Compared to settled, sedate, safety? Hardly the three Ss of a news agenda or rollocking good story. But I have far more than an interesting, entertaining faith. My God is not a God of readership statistics. Jesus is not a barometer of social media likes and shares. The Holy Spirit doesn’t get measured on His five-star entertainment rating. My faith is deeper and stronger than that. It’s the three of them inviting me into their story that have given my life fresh colour. At the start it was ‘let go of the trapeze, what next?’ crazy. Today the trapeze still happens – but now it feels so safe because my trust in them is now strong and implicit. My error has been confusing their strong, surrounded, rock-solid support with BORING. GJ&HS have removed my need to operate at speed. They have healed the hyper-vigilance that domestic and sexual assault grew in me from a horribly young age – along with the help of some cracking meds – but it wasn’t until GJ&HS was I able to understand what was going on. They have – and absolutely this is the HS at work – helped me become more other focused. I genuinely want to be kinder, more patient, have self control, be gentle, share love, offer peace. Not because I have to in order to get in God’s good books. But because that’s how the HS shapes me. A little bit more of Jesus taking shape out of this clay each day. I mistook that for boring. I replaced GJ&HS with my worldly news agenda that tells me in order to write well and to gain attention, I need to have conflict. Action. Pace. the journal of daily notes that come out of my Bible time. That when I make those notes, there can be a tingling in my fingertips and the handwriting turns to CAPS as God speaks His love and wisdom to me. To me. Wow. The God who hangs stars, calls tides, commands night and dark, speaks to me. Here is this quiet space. Him and I. All because He loves and desires relationship with ME. With us all. how, like nothing else in 40 odd years of struggling and searching, GJ&HS, Bible time, the Prayer Yurt and the support of other Jesus followers have healed my family through addictions, marital struggles, and helping me find my voice that I’d silenced for so long. Silenced due to what happened as a child when the man in the pink shirt wearing Paco Rabanne Pour Homme aftershave would enter my bedroom. No-one would be interested in that. They’d find GJ&HS doing that boring, surely? The only boring bit here is my repeating the same mistake that God’s people have made over and over for thousands of years. Of making it about me. Of me thinking it has to be fast and exciting for anyone to pay attention to what GJ&HS have done and continue to do. That God needs me to drum up attention. To be the arbiter of what makes Him exciting. How foolish, how typically human, I have been.